Spa getaways can happen everyday with the right bathroom features. After a long week, nothing rejuvenates your body and mind like a trip to the spa. You can create this type of tranquil environment in your own home with the right bathroom remodel and be able to enjoy a relaxing sanctuary any time you like. 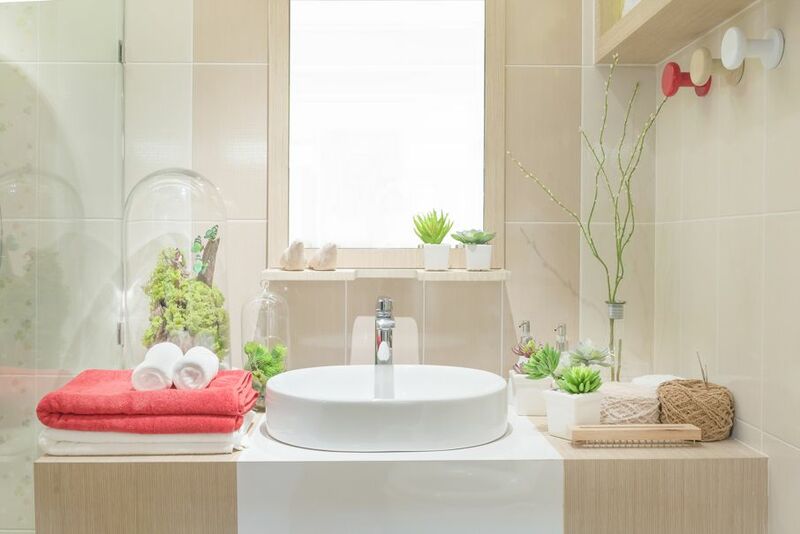 By integrating the right choices of fixtures, lighting options, color palettes, and decorating concepts and then appealing to all of the senses, you can transform your own bathroom into a tranquil spa. 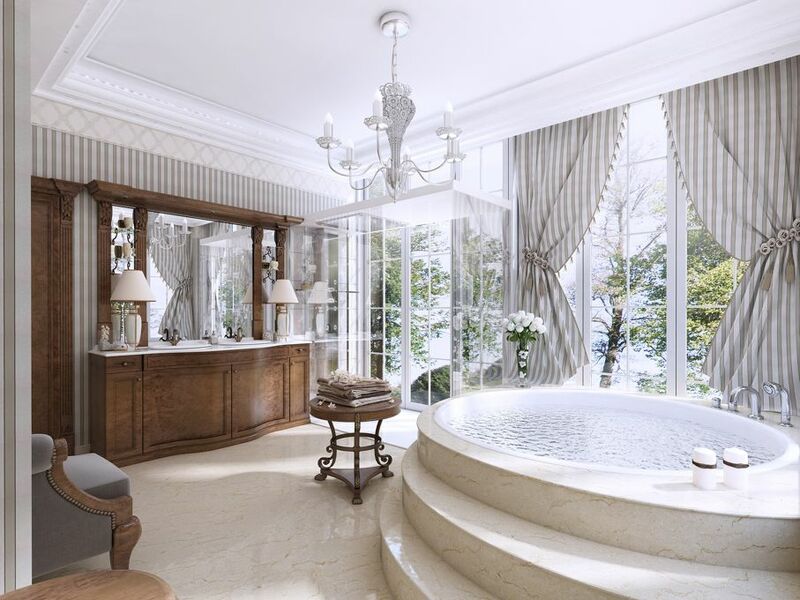 According to interior designer Abbe Fenimore, “Dreaming of a spa weekend isn’t always easy or affordable, but creating a spa-like environment in your own bathroom can be achieved easily and have you wanting to take a bubble bath every chance you get.” This starts with choosing the right bathroom fixtures. First, consider the shower. “Whether it’s a steam shower, large rain shower head, dual shower heads, hand-held or body sprays, a shower system is a must,” Erin Davis of Mosaik Design says. There are many options for upgrading to a creative shower solution that fit every budget, style preference, and room design. Some people prefer the steam shower experience, while others want to be cascaded with body-massaging water streams from every angle. If your budget allows, you can install a Jacuzzi, garden tub, or Japanese soaking tub for an ultimate bathing experience as well. Fixtures such as installing towel warmers inside a drawer add to the pampering. First, remove the clutter from your bathroom. A minimalist decorating concept eliminates stress and promotes clarity and relaxation. When you walk into a room at the spa, you won’t see stacks of magazines on the floor, miscellaneous beauty-care products scattered about the counter, and curling irons and blow dryers lying around with cords strewn about. To feel as though you are stepping into a retreat atmosphere where you can leave the stress behind, you need to remove the clutter so your mind doesn’t think about all of the things in the room that you need to organize or put away. 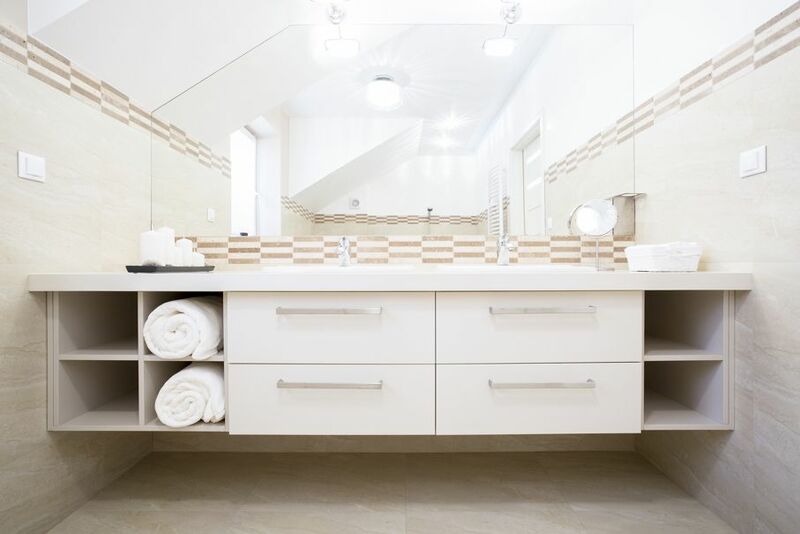 You can incorporate building additional storage space into your bathroom remodel, but be sure the storage areas are concealed with doors, so you don’t see the clutter. Any shelves that are visible should be used only to display soothing décor items such as candles, folded towels, or glass jars containing bath salts. Start with a relaxing foundation by choosing a cool, calming color palette for the walls. Spas often use shades of gray, clean whites, and cool hues of blue to set a soothing mood. You can also go for a more dramatic look with a deep red or deep green wall color, but the key is to stick to calming colors or earth tones pulled from nature that creates a calming tone rather than painting in an energizing yellow or bright orange. Choose marble flooring options to create a luxurious feel, or consider adding faux wood accent tiles for a warm, earthy feeling that also helps guard against slippery surfaces. When you visit the spa, you’ll notice how they appeal to all of the senses to create a complete sense of soothing relaxation. Adding lights with dimmers in your bathroom is an inexpensive way to allow you to lower the lights and achieve a soft, peaceful mood. You can install wall sconce lighting fixtures or recessed ceiling lights and put them on dimmer controls to create a comfortable, soothing setting. Add music by installing a sound system to drown out the sounds of traffic or household chaos on the other side of your bathroom door. Final touches such as implementing candles, music, artwork, décor elements, bath salts, and a wine tray for the tub are a few additional pieces that can help to stimulate all of your senses and enhance the total home spa experience. Create your own private home spa sanctuary through a bathroom remodel project that melts away the worries of the day without you ever having to plan a trip away from home and pay premium spa prices. Through understanding the secrets of the spa atmosphere you can learn how to recreate the same look and feel in your own home. Dim the lights and escape into your own private retreat at the end of each day.